Truckers from all round Shropshire including those from Loosemores Transport Ltd are getting ready for this years Telford Truckers Charity Convoy on Saturday 27th September 2014 in order to raise funds for The MS Trust, the trust is dedicated to making life better for people living with multiple sclerosis by providing free information to everyone affected by MS and by supporting the health professionals who work with multiple sclerosis . 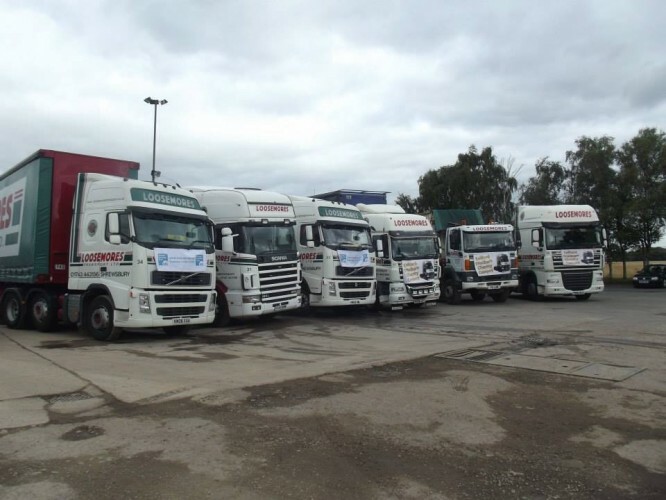 A variety of vehicles from LGVs to HGVs have been photographed in preparation for the trust’s 2015 calender and promotional banners. ‘The Truckers Convoy’ will start from Halesfield 19, Telford and head to RAF Cosford Air Museum. we wish all the participants the best of luck and have our finger and toes crossed for good weather! If your about in the area please do take an opportunity to support the convoy and trust, all support and enthusiastic waves will be greatly received. However a small WARNING all enthusiastic waves and support will be meet with an equally enthusiastic ‘TOOT’ from all The Loosemores Transport team!! For more information on our wide selection of lorries, cranes, tippers, skips and vans CLICK HERE.